Smart IOPS | Our goal is to deliver the storage and networking platform for the modern datacenter and redefine your expectations of what is achievable when TruRandom is at work! Q: How Confident Are We In Our Data Engine NVMe SSDs? A: We Don’t Even Differentiate Between Random or Sequential I/O. That’s How Much! Here’s a look at 10 independent storage developers that either came out of stealth or introduced their first offering so far this year. Smart IOPS adds to its Impressive High-Performance NVMe Solid-State Drive Portfolio! Our Legal team doesn’t want us to say we’re the best, but our customers do! Experience the power to transform your business and future proof your investment with Data Engine PCIe NVMe SSDs. Focused on Speed, Consistency and Security. Most SSD vendors happen to also be Flash manufacturers and at the end of the day, they want to sell more NAND. Unlike our competitors, Smart IOPS wants to help you solve a wide range of storage performance challenges. For High-Performance Computing and the most demanding datacenter applications, Half Height Half Length add-in cards are the ideal form factor. Directly plugged into the motherboard PCIe slot, Data Engine NVMe SSDs are backwards compatible, offer the highest performance per square inch and can be deployed in virtually any server. Go Beyond Vanilla NVMe – Go truRandom. 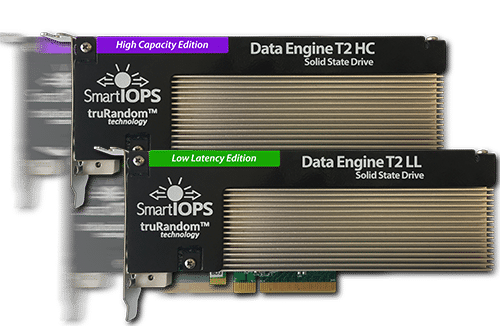 Our Patent-Pending truRandom Controller Technology Takes Smart IOPS’ Data Engine SSDs to Unprecedented Peaks of Performance. With truRandom, Storage is No Longer the Bottleneck. Smart IOPS offers $/IOPS economies of scale in SSDs ranging from 3.2TB to 25.6TB. To introduce this level of performance, datacenters would spend a small fortune on All-flash arrays. The value-driven Data Engine SSD series offer on par performance in a much smaller footprint and cost-effective packaging. Equal Opportunity Provider for Sequential or Random I/O. Dissimilar to any other SSD architecture, Smart IOPS relies on its patented controller technology named truRandom. The company’s family of PCIe NVMe SSDs – Data Engines – are all based on this technology. truRandom is a revolutionary architecture that enables Data Engine SSDs to output the highest IOPS and data throughput or bandwidth. The truRandom achievements are directly attributed to a sophisticated implementation of a fully optimized non-blocking, asynchronous controller architecture. Thanks. A salesperson will contact you within 24 hours.